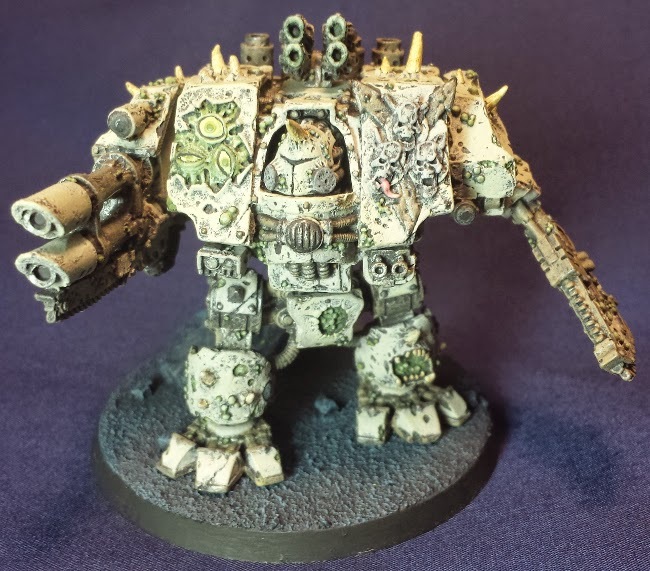 Ever since I was 15 and first laid my eyes upon Forge World's Plague Marine Dreadnought, I wanted it. Well, it was 11 years later that I finally got him as birthday present, and I couldn't be more excited. He sat on my shelf for a couple months while I finished off a few squads of Plague Marines. I was excited to paint it, but I also wanted to be ready, and not rush blindly into it. So, I bid my time, and used my Plague Marines to perfect my paint scheme. 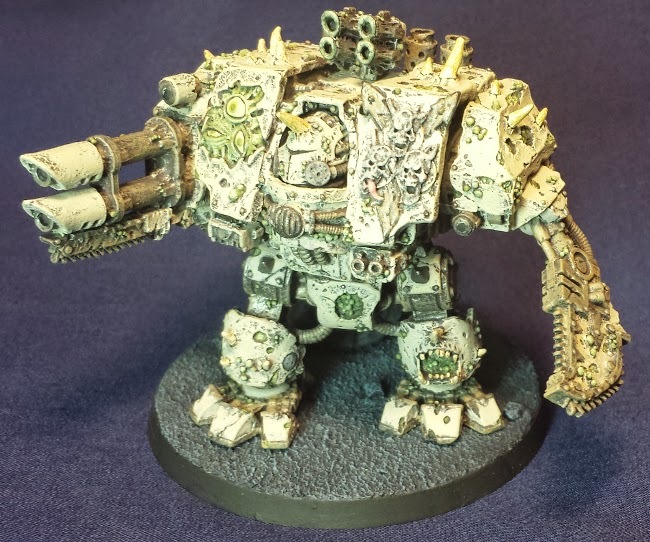 I finished him yesterday and finally, after more than a decade of waiting and almost 30 hours of work, he was finished, my pièce de résistance, my Plague Marine Dreadnought. 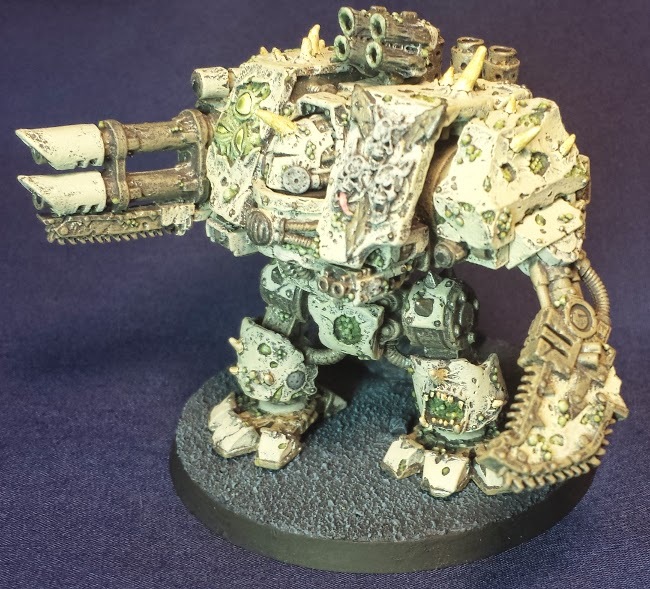 Now, I know that in the new rules Chaos Dreadnoughts are called Hellbrutes, but I think we can all agree that is stupid, and we shall keep referring to them a Chaos Dreadnoughts. I find they haven't changed all that much over the years (since I jumped from 3rd and 4th ed Warhammer 40k straight to 6th ed), but if anything, they have become a little less unpredictable. It used to be that at the start of each movement phase, you would have to roll a d6. On a 6 or 1 it would either shoot its weapons twice at the nearest target, or charge at double movement at the nearest target. It meant that was a 1 in 3 chance of something potentially going wrong, making the old Chaos Dreadnoughts a rather risky unit to field. The new rules make them a lot less crazy, only having the potential to go berserk when they have taken damage. Other than that there is not a huge difference between the old rules and new ones. Their armour is the same, their weapons systems are the same, so it is still the same old Dreadnought. A big difference is where they fit into the army list. 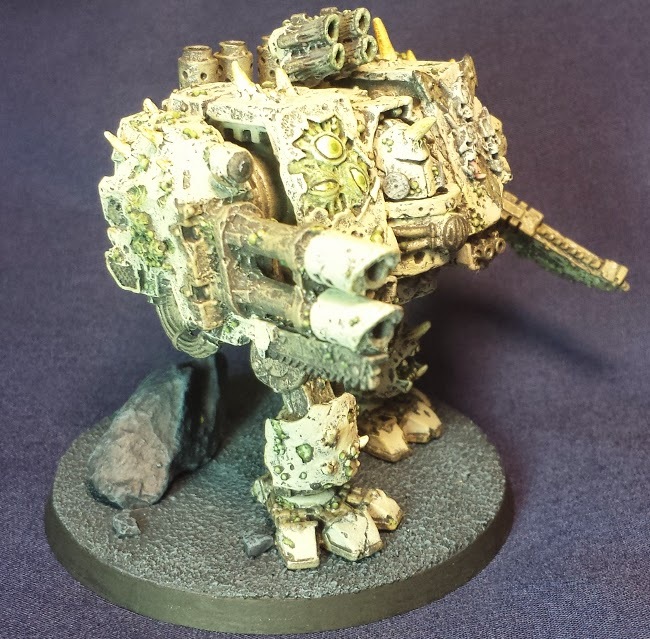 Before, Dreadnoughts were Heavy Support choices. These days they count as an Elites choice. I think the change makes sense give the story behind them. 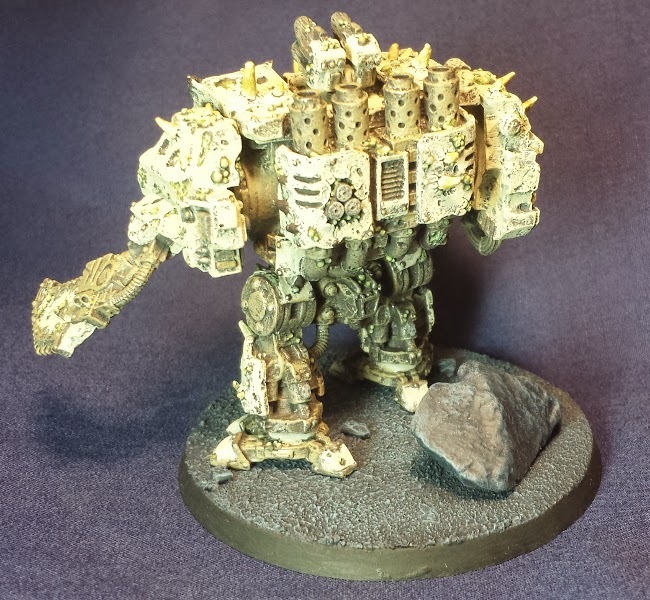 Chaos Dreadnoughts are the battle tombs of mortally wounded Chaos Space Marines. Inside, they are tortured and driven mad by the forces of the warp and the gods of chaos. In the Space Marines, being put into a Dreadnought is considered an honour and blessing. These hallowed warriors, are allowed to sleep between battles, and are generally at peace. They are not tormented by the warp, unlike the Chaos Space Marines. For them, it is a horror that most would rather forego. 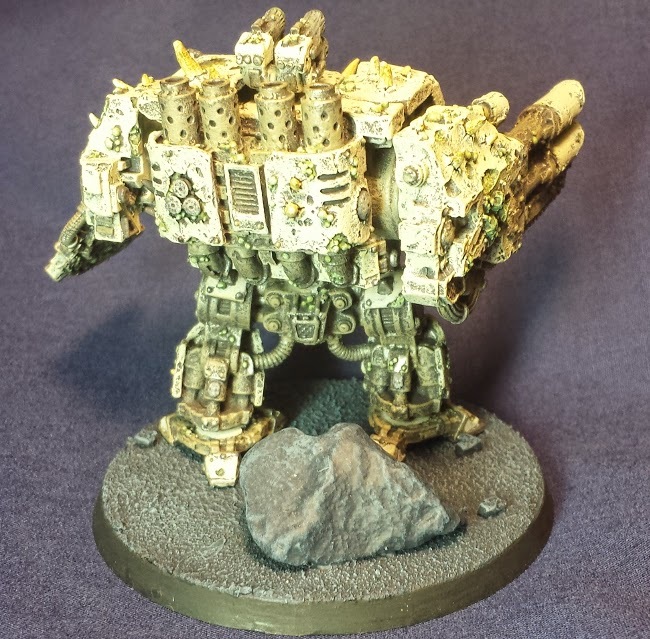 I can't wait to get my dreadnought onto the field and see it in action in its full painted glory. Looks fantastic. Would love to see pics without as much direct light so that some of the more intricate painting is easier to see against the white. Thanks! My friend (who is a professional photographer and has more than a camera phone lol!) has offered to take some pictures of it in his studio. I will post them on the blog as soon as they are finished!